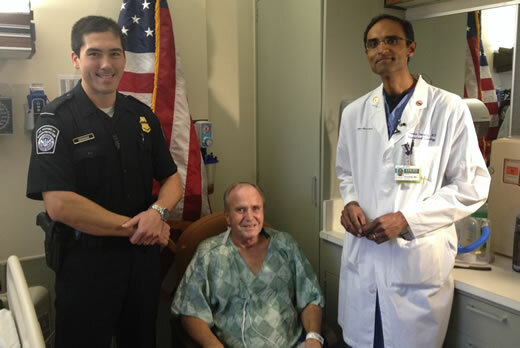 Officer John Seebode, patient John Heilig and interventional cardiologist Chandan Devireddy, MD, are all smiles on Dec. 30, 2015, the day before Heilig is discharged from Emory University Hospital Midtown. This holiday season had an extra special meaning for Florida native John Heilig — he received the gift of life in December. The 66-year-old computer technician was traveling through Atlanta's Hartsfield-Jackson International Airport on Dec. 11, in route from Hong Kong to Orlando, when he experienced a sudden cardiac arrest. A quick-thinking U.S. Customs and Border Protection agent, Officer John Seebode, instantly began CPR (cardiopulmonary resuscitation), while other agents in the airport rushed to get an automated external defibrillator (AED) and call 9-1-1. "I was thankful to be at the right place at the right time," says Seebode. "Since the response time for cardiac arrest is so critical, I knew my job was to begin CPR right away." After shocking him numerous times with the AED to stabilize his heart rhythm, Seebode was able to get Heilig's heart beating once again. "He gave me a Christmas gift — the gift of life for Christmas," says Heilig, who experienced a heart attack 10 years ago, but had no symptoms this time before his cardiac arrest. Heilig was then transported by EMS to Emory University Hospital Midtown, where interventional cardiologist, Chandan Devireddy, MD, was standing by ready and waiting with the emergency catheterization team. "We found one of Mr. Heilig's three main coronary arteries completely blocked. We were able to quickly open that blockage with angioplasty and a stent," says Devireddy, who is an associate professor of medicine in the Division of Cardiology at Emory. Heilig was thought to be out of the woods, however four days later, he suffered a second spontaneous cardiac arrest while hospitalized. "The code team immediately responded and resuscitated him," explains Devireddy. "Then we rushed Mr. Heilig back to the cath lab and successfully opened a clot which had suddenly closed the stent." Not even three weeks since his initial cardiac arrest, Heilig is doing well and was discharged on New Year's Eve. On the day before his discharge, Seebode visited Heilig in the hospital to wish him well. This was Seebode's third visit to check in on this special patient. "I am just thankful he can celebrate the New Year with us," says Seebode. "Everything has worked out quite well for this patient — from the excellent and speedy response time of the U.S. Customs and Border Protection officer to the teams of nurses, doctors, technicians and emergency responders who have provided top-notch care in the hospital. I believe Mr. Heilig will have a good start to 2016," says Devireddy. According to the American Heart Association, over 350,000 people each year experience a sudden cardiac arrest. In unwitnessed cardiac arrest outside of a hospital, only 12 percent will survive. Chances for survival triple if a bystander provides immediate, effective CPR. "Anyone can be taught how to use AEDs and to provide CPR. It's a small sacrifice to save a life," says Devireddy.